Just for information, did you stop develop mindraider? I use MindRaider on the daily basis - it is still live and I need it for myself. MindRaider is my spare time project and I'm simply too busy with my regular job and family. There are just a few minor fixes and improvements that are not worth to release. I can disclose ;) that I'm considering a transition of MindRaider to the state-of-the-art technologies (implies MindRaider rewrite). But it will not happen anytime soon. Until that time I will be sustaining and improving existing MindRaider implementation. Thanks for your reply. I just want to be sure your project will continue. just have some pbs to choose working directories in windows (ok on ubuntu, but I have 2 machinse and a common working directory. I will see if someone fix that. This should be relatively easy. MindRaider had this functionality (custom location of the repository and user profile) in the past, but I removed it because it complicated the installation. Can you please describe your configuration in particular? Do you need to have two installations working with the same data (repository)? Different login names? I have a machine on windows XP, (for my work anrd my personal one on ubuntu. Y want to work on the same directoty than on my ubuntu machine. The directory is C:\Documents and Settings\Guillou\Mes documents\My Dropbox\MindRaider (a synchronised folder for the 2 machines). Ane 2 different logins. This is an excellent idea how to share repositories between two installations ;) I'm happy DropBox user as well. Basically it is just matter of editing your profile - C:\Documents and Settings\[login name]\.mindraider.profile\[login name].xml - and changing paths and login name to the one in the DropBox folder. Let me test your setup locally first and I will describe the method in detail. Do you need my .mindraider.profile file? 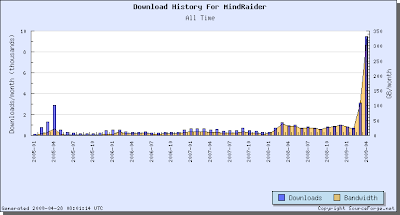 I've started using MindRaider after reading about it in the Linux Format magazine. However, I've run into a minor problem (that would require a lot more explanation than it is worth). Suffice it to say that I managed to trash my MindRaider installation. I still have all the data files that I was working on then (all the XML notebooks etc. ), but I cannot for the life of me figure out where to put them to get them back into MindRaider for editing. Could you please help me out, as I've documented quite a lot of stuff that I actually really need (fortunately I still have the files, but like I say, I can't use them...). Please let me know if it's possible to link the files back into MindRaider - where I should put them, if there are any startup scripts I should edit, etc. Thanks for a great programme, by the way! I hope I'm not annoyingly asking the same question again, but I really need an answer. I've started using MindRaider a few months ago and was mapping out work-related processes and functions. Then, I somehow managed to break my MindRaider installation. I still have all the MindRaider data files (the Notebooks and XML files), but I cannot for the life of me seem to manage to import them back into MindRaider again. Please could you help me out? I'd really appreciate it.